Barbara Chester, founder of the Labyrinth, warmly welcomed a good crowd and briefly spoke of love, truth, and peace, the true gift of Christmas. 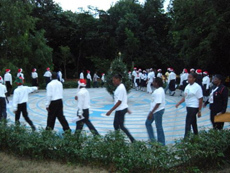 The healing gardens around the Labyrinth remained discretely illuminated for the entry of the small choir to the chiming of the Carol of the Bells. The ensemble, Marjoke and friends, ceremoniously carried their candles slowly around the Sacred Path to the centre flower, which symbolises the Holy Birth place. Still with only candlelight, they sang Silent Night, a capella, before quietly leaving Dalia Feldman in the centre to give her exquisite rendition of Ave Maria. Then came a crescendo of sound and lights; a celebration in illumination! Trees and plants were festively bathed in colour, and the majestic Tamarind, this year's 'Tree of Christmas', was brightly adorned in beams of light and glittering jewels of fairy lights. The show continued with a blend of music and song, both sacred and secular, from our generous talented friends. Dora Brown and Marjoke sang the lovely Panis Angelicus; Maria Scaglione, in a captivating red dress and overcoat, walked through the artificial snow sweetly singing, I'll be home for Christmas; James Roker tenderly sang Mary did you know? ; and later demonstrated his vocal versatility (and dancing ability!) with Joy to the World; Tony Lowe, with help from Dora, delighted us with Someday at Christmas; and Marjoke's very special vocal style invited the answer to Where are you for Christmas? and Do you hear what I hear? With dimmed lighting, we heard Dalia's sweet voice reverently singing O Holy Night. This was followed by the processional walk of the Three Kings following a magnificent star. The kings, Nathaniel Lewis, Tony and James, majestically sang their way to our Bethlehem and the Holy Babe. The splendid performers finished on a high note with Song of Joy. The audience was encouraged to join in singing some favourite carols. Song sheets and candles had been given (with the hot cocoa!) to everyone on arrival The Labyrinth, was encircled in pretty flickering candlelight and joyful singing which further lit up the magical garden. Everyone was invited onto the Path in a true spirit on Oneness, to sing and to send up written prayers and wishes over the flame of Christmas Candle... then came the grand finale, the lighting of a balloon which lifted off and went sailing through the skies reminding us all of that first great light! There was more hot cocoa for friends joyfully departing with a message of peace, hope and love in their hearts, and blessings from the Labyrinth.